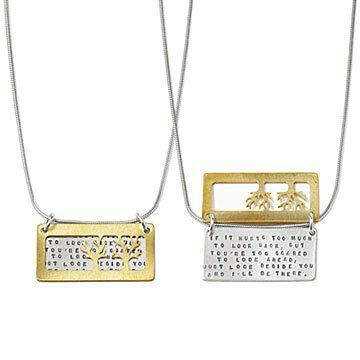 This gold-plated brass and sterling silver piece bears a heartfelt statement about the nature of friendship. Celebrate friendship and love every day with this tasteful reminder. Handmade in California. This said exactly what I couldn't! You helped say what I couldn't, thank you so much! Beautiful, quality necklace, makes a wonderful gift! I can't wait for her to open it, it is the perfect gift for her. how does one use a necklace? I would buy this gift again if I could actually read it. Its difficult to read not all the letters are engraved very distinctly. The wording doesn't really fit the pendent very well. My wife was touched by the sentiment of this necklace. She was wearing it just about every day, until my baby son broke it. He tugged on it several times without it breaking, but then it eventually lost the battle.